Starting March 15, 2012, all public swimming pools in the U.S. must be equipped with assisted entry systems. When this American Disability Association (ADA) compliance law takes effect, disabled Americans around the nation will be able to enjoy the health and leisure benefits of public pools. As part of the 2010 Standards for Accessible Design, regulations of the Accessible Design for Recreational Facilities will require all public pools and spas to be outfitted with an ADA compliant swimming pool lift or sloped entry. Such pool lifts will be required for public pools (open to the public at any time or receiving funding or revenue from the government or membership dues) greater than 300 linear feet (91.4 m). 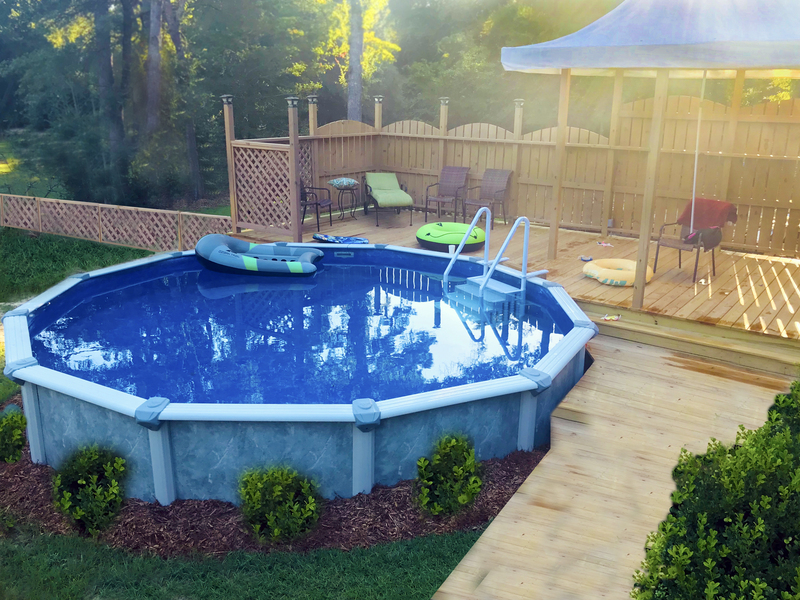 Pools greater than 300 feet will need two means of assisted entrance, while those less than 300 linear feet will only require one assisted entry system - either a swimming pool lift or sloped entry. For those pools requiring two assisted entries, a transfer wall, transfer system or stairs will be necessary in addition to a pool lift or sloped entrance. Wading pools, wave pools, leisure rivers and spas will also need a lift, sloped entry, transfer wall or transfer system. When raised, the center of the lift seat must be located over the pool deck 16 inches (40.6 cm) from the edge of the pool to give individuals enough space to move safely from lift to pool and pool to lift. 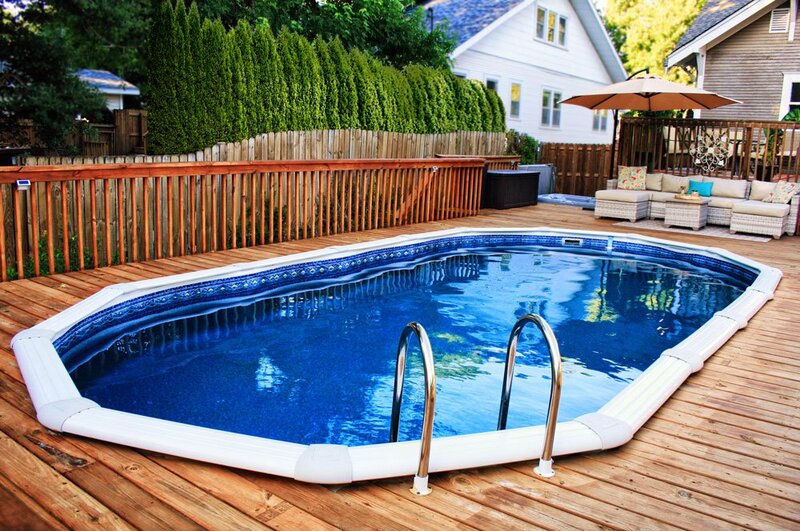 The deck space between the center of the seat and pool's edge must not exceed a slope of 1:48 to ensure wheelchairs and walkers do not roll away. The deck space on the side of the lift opposite the pool must be a minimum of 36 inches (91.4 cm) wide and extend at least 48 inches (121.9 cm) from a line 12 inches (30.5 cm) behind the back of the lift seat to ensure enough room for safe wheelchair transfer. This deck space must be parallel with the seat and again, have a slope no steeper than 1:48. Lifts must have a solid seat and footrests. Sling styles are no longer compliant. 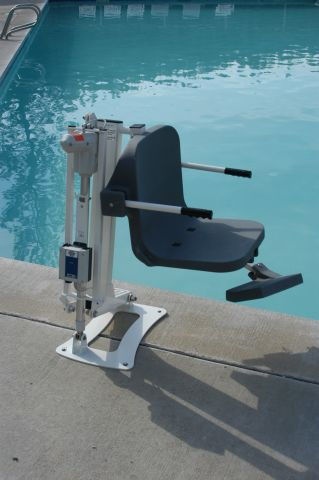 The height of the pool lift seat (from the deck to the top of the raised seat surface) must allow a stop at 16 inches (40.6 cm) minimum and 19 inches (48.3 cm) maximum to accommodate the needs of both adults and children in a standard wheelchair. Pool lift seats must be a minimum of 16 inches (40.6 cm) wide. Lifts in swimming pools shall have footrests that move with the seat, but footrests are not mandatory for lifts used in spas. Any armrest on the side of the pool lift opposite the water must be removable or able to fold out of the way to make sure transfer from wheelchair to lift and back is easy. Lifts shall be capable of being operated from the deck and from the water at all times, and operating devices must be unobstructed when the lift is in use to ensure swimmers are not stranded in the pool and multiple individuals may use the lift in a single swimming session. Manual rotating and hand-crank lift operators are no longer compliant and should be replaced. The seat of a swimming pool lift must be able to submerge to a minimum of 18 inches (45.7 cm) below the stationary water level to ensure that natural buoyancy aids in getting an individual from the lift to the water. Single person pool lifts are required to have a minimum weight capacity of 300 pounds (136 kg) and be able to sustain a static load of at least one and a half times the rated load. This regulation guarantees that lifts can accommodate a majority of the population.